How many times in the life you have ever felt content? For me, I have experienced Happiness, Sadness uncounted times in my life, but being content is a feeling which I have felt only a few times. 25th January 2015 was one of the days when I felt content. 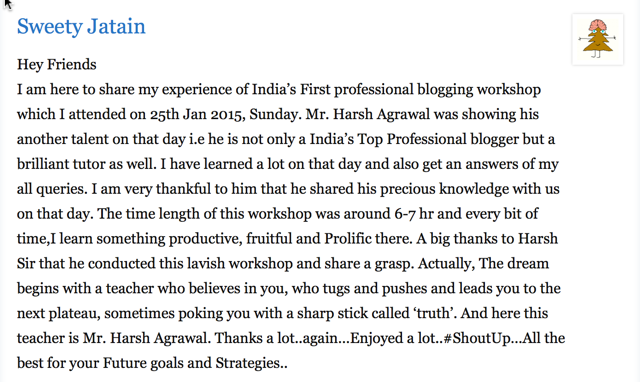 That’s because for the first time I conducted a blogging Workshop which I wanted to do it for long-time. Being happy and being content are two different emotions and I was glad that by the end of the workshop I was more content than happy. From last one and half-year I have the plan to organize the blogging workshop so that I could share everything I have learned to someone like you, who can improvise it to take it to the next stage. This story is going to be a long story because I will share everything from the inception to the point where I felt content. So if you are in hurry, just save this post and come back later to read it. How the idea of blogging workshop started? When is the next blogging Workshop? When I started blogging I was just a plain, simple blogger like everybody else. The only thing which I did differently was to help people with various stuff like blogging, SEO, WordPress and make money blogging. With ShoutMeLoud, I started interacting with bloggers to help them grow faster than what they were doing. 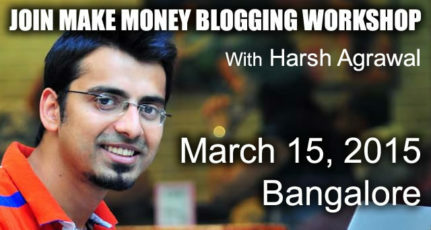 In the past 6 years, I have helped many top bloggers such as Abhishek Bhatnagar, Manish Chauhan from Jagoinvestor to grow their blog, but the idea for workshop strike into my mind last year. I used to offer one on one blogging consultancy I realized that those hours of the consultancy is helpful for just an individual but what If I can organize a full-day Workshop which could help many people and it would be cost-effective for many. Last year (2014) I was looking for a sponsorship to organise my Workshop because I had no idea or background knowledge of how to organise a workshop. 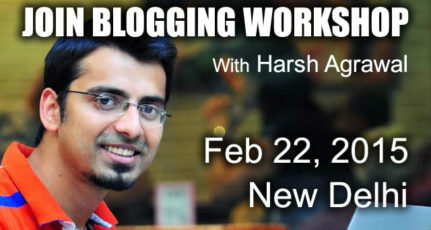 This year, when I made my mind and I shared the idea with @SharatNik, We decided to organize this Workshop at my home, where we will select interested individuals who have potential, and nourish them to take their blog to next level. I was all set to organise the event at my home-office, and I put out the first announcement post here at ShoutMeLoud. I wanted to keep the price as INR25000 initially, but later on, I brought it down to INR19000 (about $300). Within 2 days of the announcement I had almost 8 applications from bloggers and individuals who wanted to attend the event and within the 3rd day, I had 3 confirmed seats. That means 19000*3 = 57000 INR. That’s the time I thought why not give the attendees a better experience, and instead of doing it at my home office, I shifted the idea of a workshop to the boardroom of a 5 Star hotel. Since this workshop was never meant to be for money-making, and the idea was to convert my dream into a reality. While I was sure what I was going to share at the workshop, one day before I was losing my mind. Just because I was not prepared my workshop itinerary into a structured format. I knew what I had to share, but having them structured was more important as attendees should grasp and learn everything in a systematic manner. It was finally at the evening 4 P.M I started preparing for Workshop. That’s the time I put everything into the structure and in a format that would make this workshop worth for all the attendees (By this time we had all our Workshop seat full). For the workshop (This was first of such kind of event by us), we did some preparation in the form of making it the event. We got some gifts, wrote a few letters, created a feedback form and so on to add more activities to this event (Will share images later in this article). Finally, we called it a night at around 11.30 P.M. so that we can have enough sleep and be ready or big day tomorrow. We started at 10.30 at Jaypee Vasant Intercontinental hotel and when I reached there almost all the attendees were there. I was confident about the day, because I knew what I’m going to share, I knew how this day would change the life of Shouters who are attending this unique workshop. And once we started, we stopped right at the lunch-break. We had lunch and we continued with the session. The most important session after lunch was making money from the blog session, where I shared various opportunities for a blog to make money and another session was on Affiliate marketing. 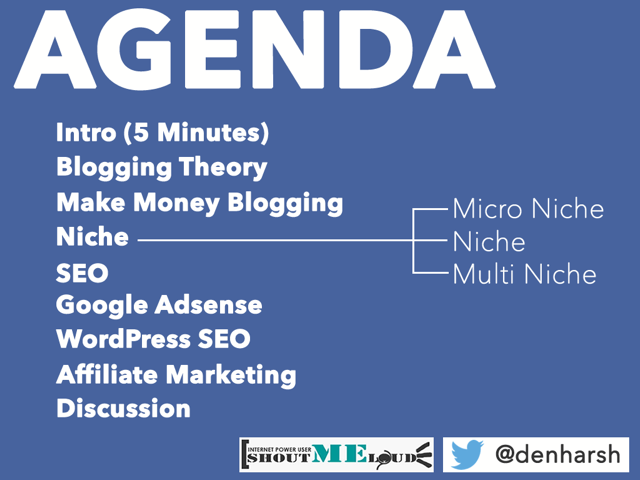 This is where I shared everything I have learned about affiliate marketing in the last 6 years. As I said in my announcement post; this is just the beginning. After seeing the result of this workshop, we will have many more Workshop in the coming days. A formal invitation post will follow-up soon. The workshop is priced at the same price like last time (INR 19000) and attendees will be hand-picked. 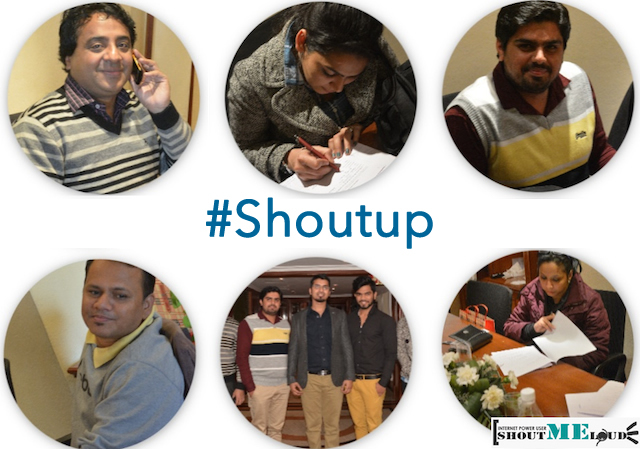 Do remember, Passion is the biggest criteria to be selected to become a part of ShoutUP WorkShop. 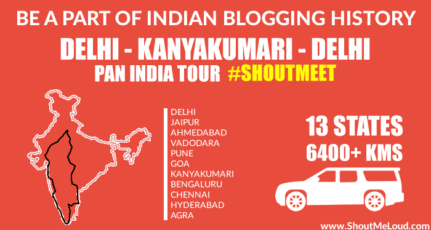 More news will follow-up soon, for now, happy blogging and thanks for being a part of Shouters community. Pretty awesome and inspiring Harsh. You’ve amassed a wealth of knowledge in the years passed, and it’s really encouraging to see how you’re giving back. I haven’t attended his workshop, but I know that he is very helpful. He presents his knowledge in very simple words. I am not interested in blogging, but I visit this site daily and read all his posts. All the best for future workshops. 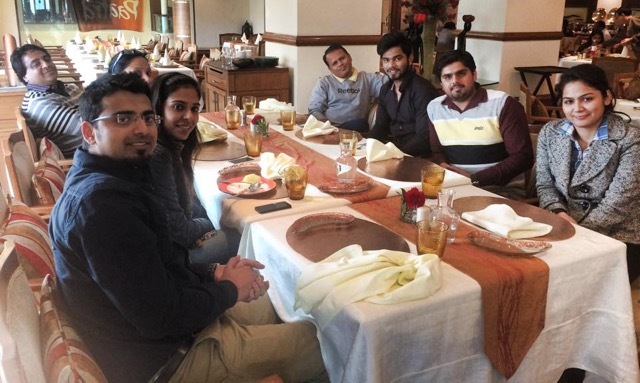 Hi Harsh, You have a great team with great content for all online marketing solutions. here i got all latest news about new SEO trends. that was an inspiring post and i wish i could be there but i am sure that next time you plan for this type of meet i will sure make up for the meet. Great Theory of shoutup. Taking shoutmeloud to a new and more higher level. Great and inspiring post. You are doing a great job, I hope one day I could join your workshop and learn more about blogging, but I think it’s my bad luck that I am here at Kathmandu. I have a doubt… Why not you share the videos of the #shoutup ..?? Great concept of shoutup. Taking shoutmeloud to a new and more higher level. Great and inspiring post. I am always your big fan. I would also love to join more of your seminar’s. Please do let me know about that. Great post, I am a fan of shoutmeloud, Great concept of shoutup. Really it is inspiring post. 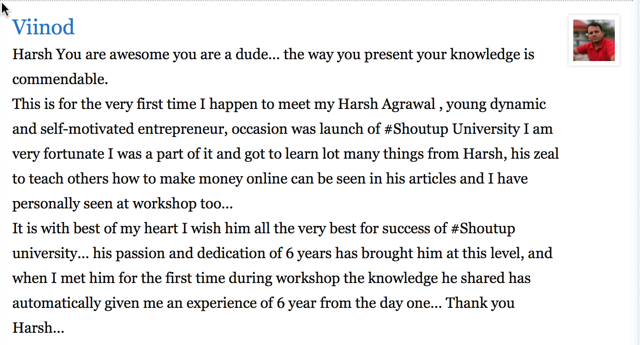 Thank you Harsh I started by first blog after I started reading your blog. Glad to hear that. Welcome to the world of blogging! Nice to see your awesome team. It’s really encouraging to see how you’re giving back. The picture says the whole. It was an awesome workshop i guess. Well waiting to get more from my favorite blogger.